In this Monday, June 25, 2018 photo, people gather at the Supreme Court awaiting a decision in an Illinois union dues case, Janus vs. AFSCME, in Washington. 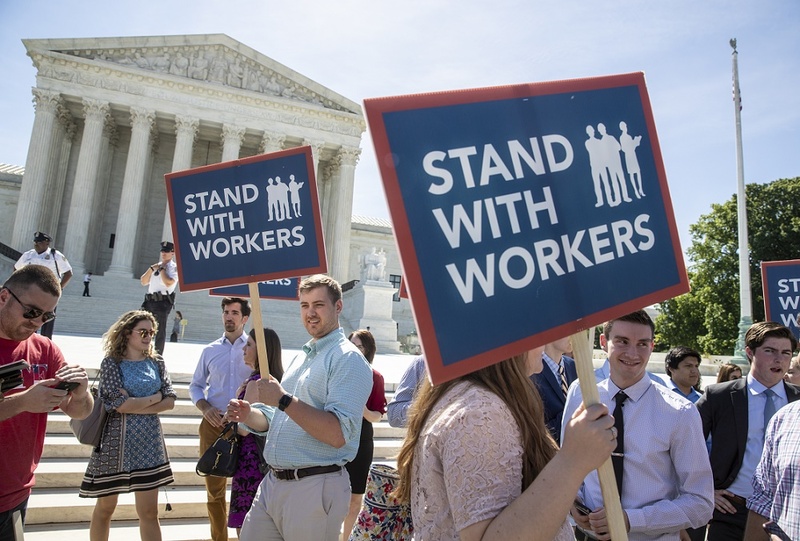 The Supreme Court says government workers can’t be forced to contribute to labor unions that represent them in collective bargaining, dealing a serious financial blow to organized labor. SACRAMENTO, Calif. (CN) – In the aftermath of a landmark Supreme Court decision barring employee unions from extracting mandatory fees from workers who do not want to contribute, two government employees sued their union to get back the money they were forced to pay. It is one of the first cases of its kind to emerge in the wake of Janus v. AFSCME, handed down by the nation’s highest court June 27. Lead plaintiffs Jeff Lyon and Karen Sandberg filed the class action in Sacramento County Superior Court on Tuesday, saying they were due restitution for the agency fees paid to the Union of California State Workers over the course of their careers. Lyon worked for the California Department of General Services from 2001 until 2014, paying as much as $40 a month in agency fees to the union despite not being a member. Sandberg worked for the state in various positions and for various departments over the course of a long career in public service from 1989 through 2015. Sandberg did not belong to any union but paid as much as $90 a month in agency fees to the state workers union. “By this action, plaintiffs seek restitution of all involuntarily paid agency fees from the defendant unions, with interest, for themselves and for all others similarly situated,” the pair says in their complaint. They are represented by Eric George of Browne George Ross in Los Angeles. The Janus decision was celebrated as a triumph of free speech by the victors, who argued forcing nonmembers to pay dues is an unconstitutional violation of their rights. The court ultimately agreed 5-4, along ideological lines. Leading up to and after the decision, labor advocates have expressed worry that working Americans will be hurt and the clout of unions will be diminished. “In this case, a bare majority of the court, over the vigorous dissent of four justices, has conceded to the dark web of corporations and wealthy donors who wish to take away the freedoms of working people,” AFL-CIO President Richard Trumka said after the decision was handed down. The Union of California State Works, also known as SEIU 1000, did not respond to requests for comment as of press time.